We manufacture PVC Metal Cable Channels ( Seuro Ceramics) ducts that are used for telecom connections. These are very sturdy and made of the premium quality steel which is tested for many parameters. 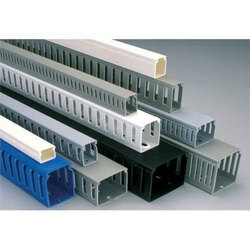 These PVC cable ducts come in a verity of lengths and diameter which can be customized if the client so desires. We are providing the good channel plans in all over Delhi or work as a believable manners since 2002. We are offering PVC Cable Channel to our clients. Application: Ideal for laying of underground signal , communication, power cables along railway routes, in power plants, industrial installations Podium, Landscape and large lay outs. PC Channel is substitute for RCC concrete trenches. We are involved in offering a wide range of Cable Channels to our most valued clients. Our range of Cable Channels is widely appreciated by our clients which are situated all round the nation. We offer our range of Cable Channel at most affordable prices. Dave Shah & Co.(switchgear) Pvt.ltd. 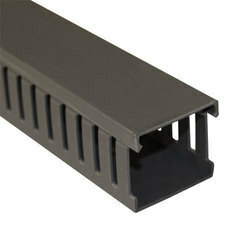 Used for orderly and structured routing of cables, consists of mounting panel to which are fixed a number of cable loops. They help to run the cable bunches horizontally along the front or rear of the cable and branch out the connections to termination points directly above or below.